Well, aren't you guys an opinionated bunch?! I love it! Thank you so much for your votes and comments about the guest bathroom shower curtain dilemma. I'll give you guys a couple more day to chime in with your two cents and then I'll tally up the votes... there isn't a clear winner yet! I need to start asking you guys for more help like this because you certainly deliver. Thanks again! I know some of you may feel that chevron is a little "overdone." Especially in the blog world, where we tend to grab onto a trend and love it to death (peonies, anyone?!). But lately, I've had a revived interest in all things chevron. As you know, I've got a chevron pillow (from The Lacey Placey) in my living room. 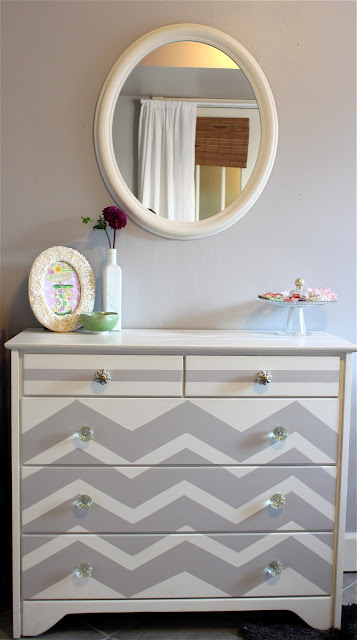 But recently I realized I'm itching to do a fun chevron-inspired project around my house. If you follow me on Pinterest (come check me out here! ), you'll notice I've been pinning a lot of chevron lately. Check out a few things that have been inspiring me! Yes, I literally said holysmokes when I saw that chevron tiled kitchen backsplash. Amazeballs. Maybe once the dust settles and we're done with all of the "before-we-sell-our-house" projects, I'll dive into a little chevron project of my own. Until then, stop on by for more inspiration over on my Pinterest account! I still love it too. I have those stairs on one of my pinterest boards and would really love to do that on risers one day. It adds such a graphic punch to a traditional staircase. Loving all your inspiration pics! Love it too! That backsplash is amazing, but I have to admit...I'd probably would get over that one quickly. 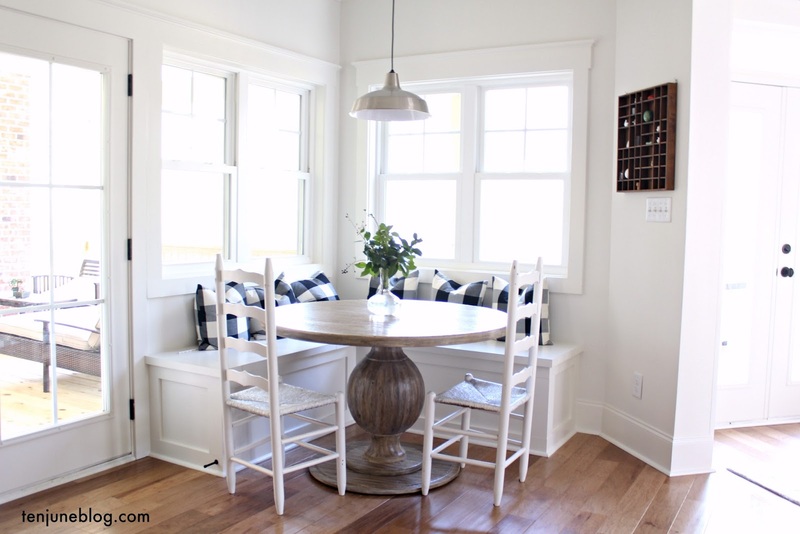 I love the chevron but I especially love the chair in the eighth picture ! love all of these pics! i'm a little obsessed too! I'm not tired of chevron either. I just got a navy and white chevron phone cover with a kelly green "S" on it. Can't wait to use it. nope dont think I'll tire of the chevron pattern anytime soon either. 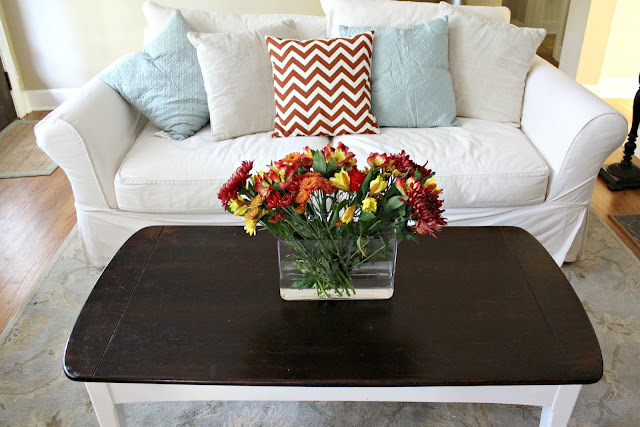 I just bought a chevron rug for my living room and totally did a happy dance when I put it in. I think motifs like Chevron, Greek Key, Quatrefoil are all classic and will always be in- regardless of how many times we see it in blog land. I love chevron patterns and who cares if some peeps say it's overdone? The backsplash is complete awesome-ness! I seriously just did a post on chevron too! I'm in the middle of redoing our upstairs bedroom into an office, and now that I know you have a pinterest account, I'm going to stalk your ideas, hope you don't mind:) You are so talented with DIY projects, you're going to inspire my home decor creative side! !